Aerial view of Cancun's Hotel Zone. A new study found that Cancun is the city most dependent on tourism. According to a report from the World Tourism and Travel Council (WTTC), the popular Mexican destination owes almost half of its gross domestic product (49.6 percent ) to the tourism industry. 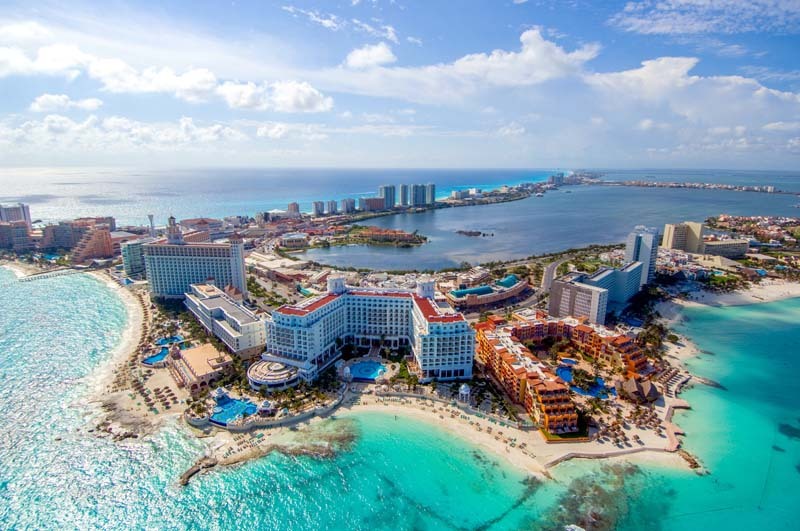 The United States makes up the majority of foreign visitors to Cancun at 63 percent, but Canadian arrivals continue to rise. The number of South American visitors has also jumped in recent years, with Argentina climbing toward the top of the list. Cancun is almost 20 percent more dependent on tourism than the No. 2 city on the list, Marrakesh, Morocco, which boats a tourism industry that accounts for 30.2 percent of its GDP. Macau, Orlando and Antalya rounded out the top five, with 29.3, 18.7 and 17.6 percent of their respective GDP being attributed to tourism. Shanghai, Beijing and Paris topped the list for tourism market size. The WTTC report also found that over 500 million trips are taken annually to cities across the world, driving significant increases for the tourism industry within city boundaries. Overall, the growth generated $625 billion or 6.7 percent total GDP across the 72 cities in this study, while the industry generated 3.2 percent of the global GDP.